Laser acupuncture, specifically Low Level Laser Therapy (LLLT) or Cold Laser Therapy, is one of the latest major advancements in the practice of acupuncture. While traditional acupuncture originated in China over two thousand years ago, LLLT is relatively recent and has been applied in the medical field since the 1970s. Due to the increased availability of lasers , their use significantly increased ever since. Modern technology and advancements in medicine have allowed acupuncture to adopt this new method of treatment, which utilizes painless lasers to stimulate the key points on the body. These lasers are known as “cold” lasers because they do not cause any change in temperature of the targeted tissue. They are safe and painless, and let acupuncturists such as Nana Efrem M.S. treat patients faster and with virtually no side effects. 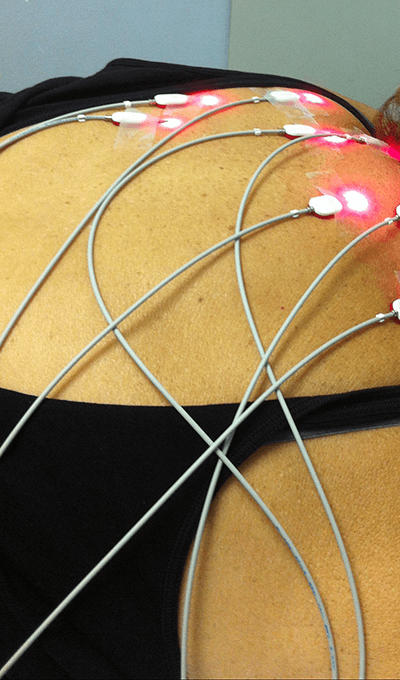 Applying laser light to injuries, pain, inflammation, burns, lesions, and various other conditions is known as Low Level Laser Therapy (LLLT), or Cold Laser Therapy. This technique stimulates healing within the damaged tissues and cells. LLLT is utilized all over the world in order to treat a multitude of disorders with great success. LLLT relies on a physiological interaction between laser light and our bodies. When laser light is absorbed by a living tissue, several biological reactions are triggered in the cells of the targeted tissue. These reactions produce chemical substances which are released and then transported by blood and lymphatic system. This means that LLLT can affect other parts of the system, and not just the targeted local tissue. Production and release of natural pain killer endorphins that reduce pain. Suppression of inflammatory enzymes that are responsible for swelling, redness, pain, and heat, combined with the release of anti-inflammatory enzymes reduces inflammation. Increased circulation and healing due to increased lymphatic drainage. Stimulation of fibroblastic and osteoblastic growth induces faster bone repair. In the correct wavelengths, laser light penetrating into the tissue induces photochemical and photo-biological responses. This process occurs within the mitochondria, which is an organelle in the cells responsible for producing ATP (adenosine triphosphate). Build-up of single oxygen molecules due to absorption of light from the laser increases the production of ATP (the source of energy for cells) by 10 times the average. Accelerated formation of ATP stimulates greater immune response, thus improving the healing process and reducing pain. LLLT and dentistry go hand-in-hand. LLLT enables dental procedures that were previously thought impossible and also greatly improves upon scalpel and electrocautery operations. Cold laser therapy reduces pain, facilitates wound healing, relieves muscle tension and regenerates nerves without using any pharmaceuticals and the side effects that come with them. Cold laser therapy (or LLLT) will dramatically decrease swelling, pain, bruising and inflammation after an operation, thus reducing (or completely eliminating) the need for post surgical analgesics. In addition, many dentists utilize LLLT for analgesic purposes during tooth restorations. Laser acupuncture in dentistry is also used to reduce gag reflex. Some patients have an extremely sensitive gag reflex, which makes dental work difficult and stressful for both parties involved. When a laser is applied to the P6 acupuncture point on the wrist, gagging and nausea sensations will greatly decrease, and the patients will have a much easier time undergoing the procedures. Dental implants can cause considerable pain, discomfort, and inflammation. LLLT used during the preparation and placement of implants can greatly reduce these effects, as well as facilitate the integration of the implant into the bone, thus significantly decreasing post-operative pain and improve bone formation around the implant. LLLT has also been found to be very effective for treating facial pain (acute or chronic). Patients may experience facial pain and muscle tension after a long dental appointment. Applying the laser to the masseter muscle following the dental procedure will decrease or even eliminate muscle trismus and joint pain.